I have so much ribbon and I find the spools take up a lot of space, plus the ribbon tends to unwind and make a mess. 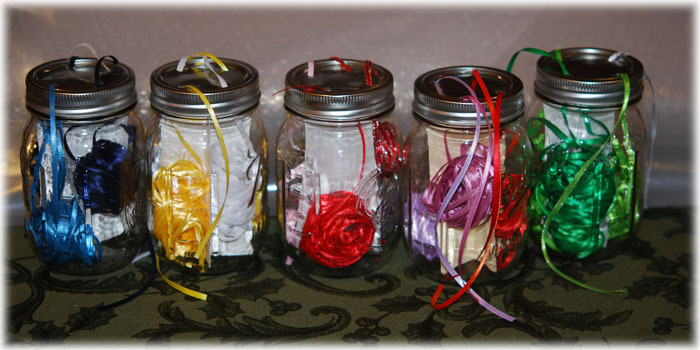 I saw something somewhere online where someone had taken pretty jars and put a ball of yarn in each jar with a hole in the lid to spool the yarn out through. I didn’t immediately think of this idea, but later, it came to me that something like that might work for my thin ribbon, and so I came up with this idea. Jar with screw on lid –I used canning jars because I have a bunch someone gave me, but any sort should do –recycle something. 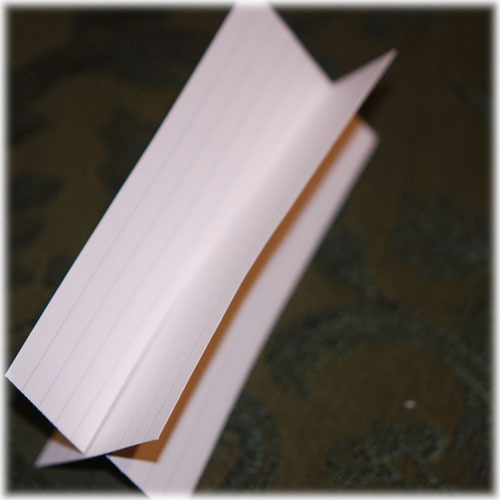 Index card or cardstock paper, or even an old greeting card or a cereal box you are going to throw away –just something that thickness. Start with a clean and dry jar and lid. Measure the opening of your jar and cut the index cards (or cardstock, etc) a little wider than the mouth of the jar. This is all a little approximate, as the shape of your jar will dictate the exact size you are going to cut this. 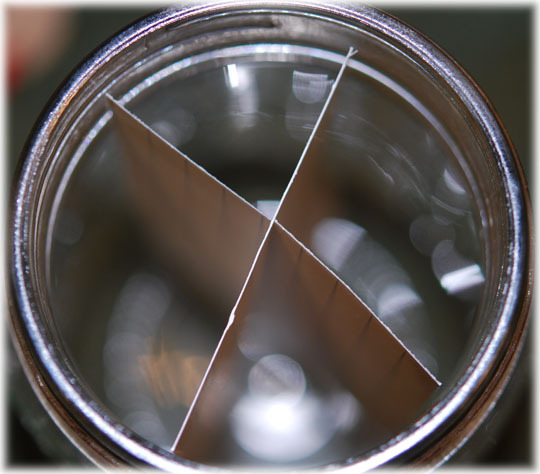 Cut both pieces somewhat shorter than height of the inside of the jar, so that they come up about to where the screw part of the jar starts. You should slip one of them into the jar to measure and see if it’s going to fit. Next, cut a slit up the middle of each piece, a little more than halfway up. Then slide them into each other to form an X . Look at the photo, it’s easier to see than to explain. You want it to stand up and have four sections to put your ribbon into when you put the pieces together. I found that I had to trim a little and to make the slits a little longer than I thought, but because I made 5 I just worked until I got the first one right and then used that one for a template. If you use the same size jars and make multiples, that’s the best approach. 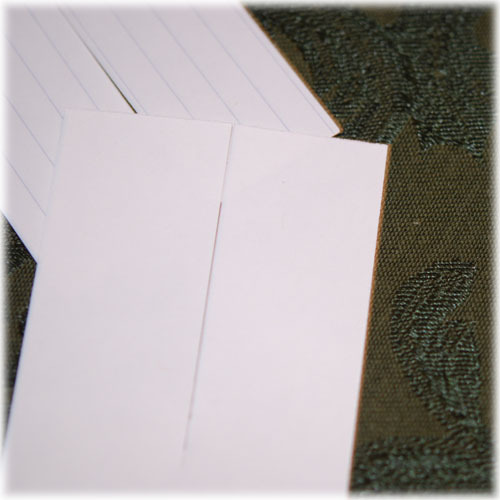 One nice thing about index cards is that they were almost exactly the right size to begin with, so there wasn’t that much trimming to do. 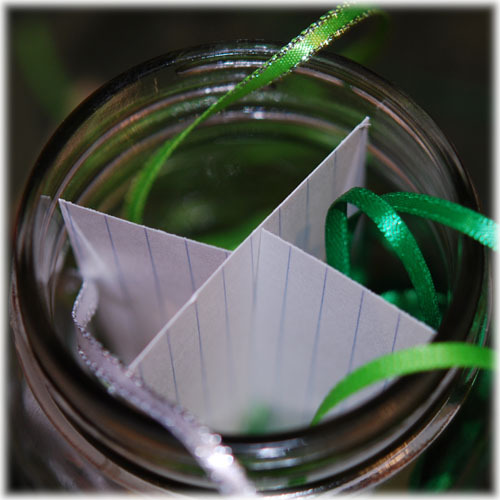 Once you get the divider made, put it into your jar, take your ribbon off the the spools and wind it into balls. I wound it around 2 fingers, not overly tightly. 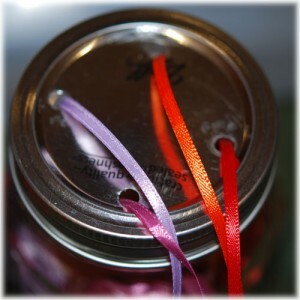 Then slip 1 ball of ribbon into each section and pull the loose end up so that it doesn’t fall down into the jar. My husband did this next part for me, but it’s not difficult. Drill 4 holes in the lid, evenly spaced. He used a 3/16 inch bit, but said a 1/4 would probably work as well. He then filed them with a round file to make it smooth and flattened each hole between 2 hammers. That way they won’t snag your ribbon. Then you can thread the ribbon through the holes and screw the lid on! All done! I think it even looks nice, and these take up less space. I think this is going to work much better. Oh, and I can easily see exactly what colors I have. Hopefully this will be as helpful to you as it is to me. I know I still have to come up with some more good ideas for taming my wild craft room, but this is going to help! Oh, and I clearly have too much ribbon! hmmm, that is a good idea for yarn, because I wind them into center pull balls – would need a larger jar but what a great idea. I still have one of the old soda pop bottles that mom used to put her yarn in where they had the black bottom that would pull off the bottle and you would cut the bottom of the bottle off and put the black part back on so you could put the yarn in the bottom and thread it through the opening where you poured the soda out at the top and it would keep the ball from bobbing everywhere when you were knitting ;). That sounds vaguely familiar. I wonder where she got soda bottles with a bottom that would pull off. I had thought of cutting the bottom off of beer bottles and doing something like that although I couldn’t think of how to make a cover for them. I wonder if somewhere in my memory were Mom’s yarn bottles and that’s what made me think of that? That’s who I came up with this idea in the first place –it meandered through my mind in quite a few forms before it finally ended up here –but soda bottles would work for bigger ribbon. i smiled when i saw those jars and my creation for this week handmade monday are jars like these!